If your VBA procedure needs to ask the user for a filename, you could use the InputBox function and let the Excel user do some typing. An input box usually isn’t the best tool for this job, however, because most users find it difficult to remember paths, backslashes, filenames, and file extensions. In other words, it’s far too easy to screw up when typing a filename. For a better solution to this problem, use the GetOpenFilename method of the Application object, which ensures that your code gets its hands on a valid filename, including its complete path. The GetOpenFilename method displays the familiar Open dialog box (a dead ringer for the dialog box Excel displays when you choose File → Open → Browse). The GetOpenFilename method doesn’t actually open the specified file. This method simply returns the user-selected filename as a string. Then you can write code to do whatever you want with the filename. GetOpenFilename method takes the optional arguments below. ButtonText Ignored (used only for the Macintosh version of Excel). 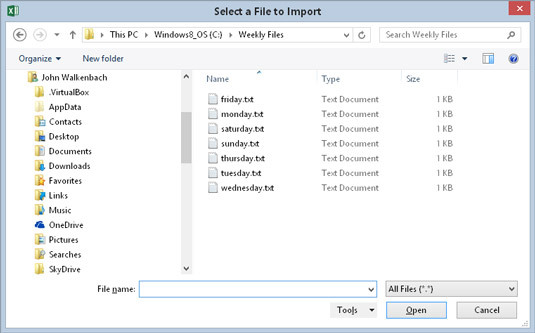 MultiSelect If True, the user can select multiple files. The first part of this string is the text displayed in the Files of Type drop-down list. The second part determines which files the dialog box displays. For example, *. * means all files. The code in the following example opens a dialog box that asks the user for a filename. The procedure defines five file filters. Notice that the VBA line-continuation sequence is used to set up the Filter variable; doing so helps simplify this rather complicated argument. Here is the dialog box Excel displays when you execute this procedure. The appearance may vary, depending on the version of Windows you use and the display options you’ve set. The GetOpen Filename method displays a customizable dialog box and returns the selected file’s path and name. It does not open the file. Notice that the FileName variable is declared as a Variant data type. If the user clicks Cancel, that variable contains a Boolean value (False). Otherwise, FileName is a string. Therefore, using a Variant data type handles both possibilities.